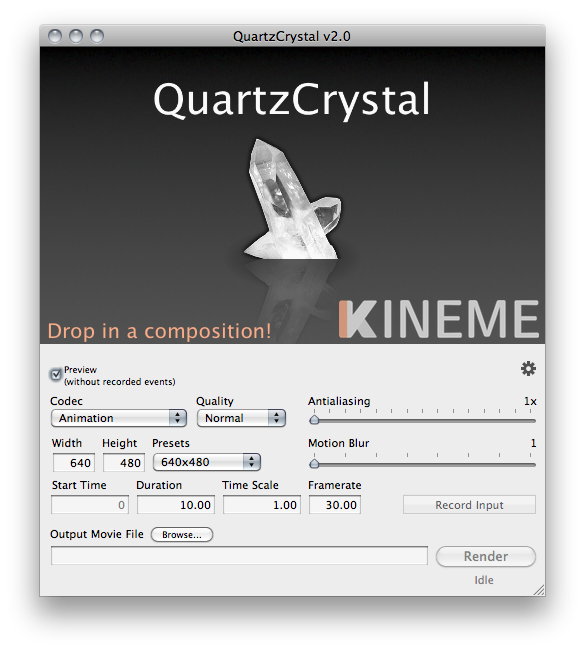 QuartzCrystal is an application for rendering Quartz Compositions to QuickTime Movies and Image Sequences. It supports 3rd Party plugins --- both Official and Unofficial API --- as well as unsafe patches. 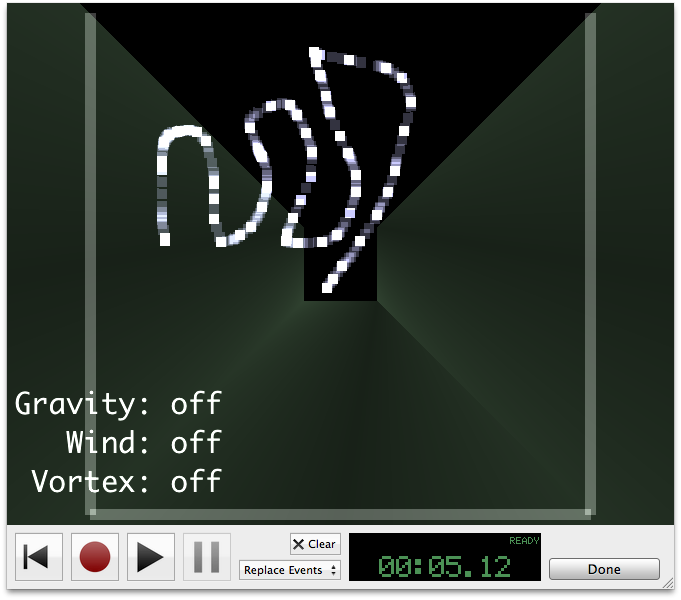 It also supports up to 64x Spatial Supersampling (Antialiasing) and up to 1024x Temporal Supersampling (Motion Blur) per frame, as well as recording interactive events for later rendering. Download the trial below, or buy a license now. See below to download the free trial version of QuartzCrystal, which is full-featured, but draws a black checkerboard on top of the rendered output movies. Purchasing a license removes this limitation. 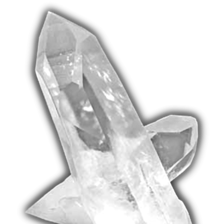 Footnote : QuartzCrystal performs Spatial Supersampling. This is not the same thing as OpenGL's "Full-Scene Anti-Aliasing" (FSAA) --- it's better. When you enable Spatial Supersampling, QuartzCrystal renders your composition at the specified multiple of your target size, and then applies a high-quality scaling filter to reduce the rendered image to the intended size. All parts of your composition get the same supersampling treatment --- not just lines and poly edges (or whatever your video card supports) as is the case with OpenGL FSAA. 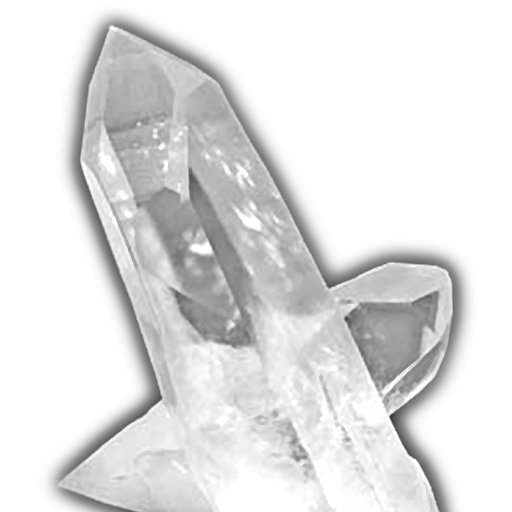 Footnote : QuartzCrystal performs Temporal Supersampling. When you enable this feature, QuartzCrystal renders your composition at the specified number of time-slices for each frame, and blends these slices together --- resulting in smooth motion. Please download the trial and make sure it meets your needs before purchasing. Due to bugs in Apple's Quartz Composer framework, we cannot guarantee that Kineme apps will work properly on Mac OS 10.8 and above. Our focus has shifted to developing Vuo. Double-click the .zip file to uncompress the application. Place the application in your /Applications/ folder. Double-click the application. Follow the Version link for release notes and supplementary downloads (sample compositions, source code, et cetera).